Now maybe it's because my mom saves every piece of plastic take-out container and food jar, or always cleans her plate (and yours) and still manages to be about 95 pounds of trim, South Korean churchlady but I love recipes that use every bit of it's ingredients. Like Kori Tang. Now for those of you who have yet to get over the TAIL portion of oxtail please know it is BEEF, tastes just like beef but manages to be both lean and tender at the same time. It is a delicacy because it is a small portion compared to other cuts, and there's something about the ample bits of beef wrapped snugly around a big marrow-filled bone that give it an essence of beef flavor. In a subtle but pure way versus the in-your-face big flavor of steaks and grilling meats. Fill with water as discussed above. Add 5-8 garlic cloves, 1-2 sliced onions. Bring to boil, then simmer on the lowest simmer setting for at least an hour. Add peeled and cubed betchoo (turnip). Salt and pepper liberally to taste. Return to simmer for about twenty minutes or however soft you like your turnip. Eat as much as you want or remove as much as you want for eating before the next step. ...Add bones (probably without the small knob bits that fall off each oxtail piece) back to the soup and simmer again for about two or so hours until the bones release their marrow. Soup will be milky white. Garnish with scallion if you prefer. Mmm...ox-tail soup If I had a rap band, punk rock band, whatever kind of band, I would name it 'oxtail soup' because that's how awesome the stuff is. Your description was right on the mark. It made me want to go eat some. 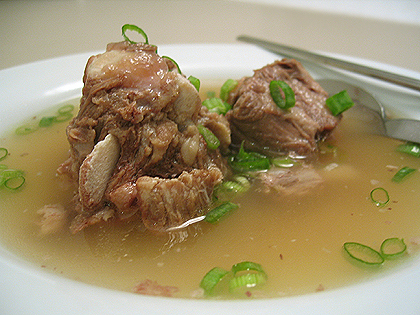 Unfortunately, because all cows only have one tail, oxtail soup is expensive here in korea. that's why you should move back to the states. ha ha. Hi! I'm a friend of Becky's. Your interests and mine align perfectly. =) I'm looking forward to your future entries. did you know this soup is also know as gom (bear) gook? I thought it was a bear stew when i was younger but didn't complain once cuz it was so damn good! jung, It never occurred to me that it was kom as in "bear". that's really cool and also makes me wonder what the original connection was, maybe linked somehow to the birth of korea myth?